The main credit score used in the business world is known as a Paydex score provided by Dun and Bradstreet. This number assess a business’s lending risk much the same as a consumer credit score reflects a consumer’s individual credit risk. Paydex is essentially the business equivalent of your personal credit score. The exact definition from Dunn & Bradstreet or D&B is: The D&B PAYDEX® Score is D&B’s unique dollar-weighted numerical indicator of how a firm paid its bills over the past year, based on trade experiences reported to D&B by various vendors. There are many BIG differences from a business Paydex credit score and an individual FICO consumer credit score. Consumer FICO credit scores range from 350-850. The Paydex Score ranges from 0-100 with 100 being the highest score you can obtain. Individual credit scores are calculated based on a number of factors. The Paydex score is calculated based on only one single factor; whether a business makes prompt payments to its suppliers and creditors within the agreed upon terms of payment. 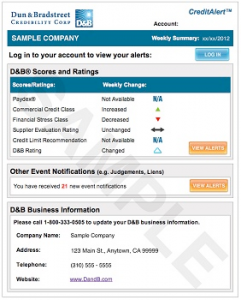 Most lenders and suppliers are looking for a score of 70 and higher. Having a score of 80 and above is very good. If you own a business in Indiana, your Paydex score is essential in establishing new credit and continuing to build credit limits exceeding $100,000. It only takes 60 days to establish a positive Paydex credit score. To start you will first want to apply for a DUNS Number, a nine digit business identifying number, with Dun and Bradstreet. Once your DUNS number is established you will next want to find a merchant who will extend you credit and then report that credit to Dun and Bradstreet. Once you have positive business credit report to Dun and Bradstreet you will have a positive Paydex score established. You will want to then apply for more business credit and use it regularly. Make sure you pay all payments back early to raise your scores to 80 or higher. You can easily and quickly establish a positive Paydex credit score. As you continue to pay your bills timely your scores will continue to rise giving you the ability to qualify for credit in your business name. Miguel L Silva is currently the Founder/CEO of InCreditable Advisors located in Indianapolis and Plainfield, Indiana. At InCreditable Advisors he specializes in helping Indiana business owners establish excellent business credit scores and then leverage those scores to access cash and credit for their Indiana businesses. Miguel L Silva is also the organizer behind the release of the exclusive Indiana Business Credit Funding Suite.